The partial federal government shutdown has cut services at wildlife preserves, but it’s not stopping bird watchers and other wildlife enthusiasts from exploring. At Desoto National Wildlife Refuge in western Iowa, the visitors center and most of the trails are closed, but John Calhoun from Papillion, Nebraska, says he still had a productive day taking pictures of birds. Staff numbers at DeSoto have been reduced by the shutdown, but Chuck Traxler, with the U-S Fish and Wildlife Service, says the limited trail access is not related to what’s going on in Washington. 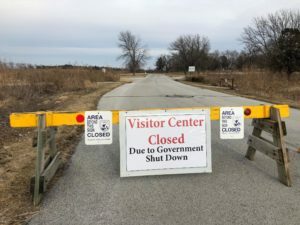 Fish and Wildlife is not charging entrance fees at refuges during the partial shutdown, which is in its third week. Iowa has seven National Wildlife Refuges. Traxler encourages people to get out and visit them, even while the government is shut down.